Alachua County, Florida Alachua County, Florida U-Pick farms: Find a pick your own farm near you in Alachua County, Florida for fruit, vegetables, pumpkins, organic foods,local produce and more! Looking for a local, pick-your-own farm in Alachua County, Florida? Scroll down this page and you will see the U-Pick farms in Alachua County, Florida, sorted by county. Those that offer organic or sustainably grown produce are identified by the words "organic" and/or "sustainable" in Green, next to their name (see "What does Organic mean?"). The U-pick crops they offer follow the name of the farm. To search the page for a specific crop, use Ctrl-F (or on an ipad or Mac, use their "search on this page" function) If they have a website, the name will be in blue and underlined; click on it and it will open their website. If you find anything outdated or inaccurate, see the customer and farmer menus (as appropriate) at the top menu bar to submit updates and corrections and help me keep each current! 11908 S.W. First Street, Micanopy, FL 32667. Phone: 352-494-9932. Alternate Phone: 352-466-4327. Email: [email protected]. Open: no berries this year (2013) due to late freeze; See the visitor comments below, May 5 to June 28. Directions: 4 miles south on Highway 441 toward Micanopy, Florida from the Gainesville city limits. Make a right hand turn onto S.W. First Street and we're at 11908 S.W. First Street. There will be signs on the road. Click here for a map and directions. We do not use pesticides on the crops. Payment: Cash, Check. $1/lb on weekdays and $2/lb on the weekends. We have 8 acres of bluberries with early and late harvest dates. We were USDA Certified Organic with QCS in Gainesville, Florida for 7 years and still are organic! There is port-a-potties on site. There is plenty of parking, lots of picking buckets, belts to wear and bags to put the berries in. There's plenty of shade trees. Formerly called "West Morgan Farms". Comments from a visitor on May 17, 2012: "Looks like the listed hours are out-of-date: I called them this afternoon (a Thursday) and was told they were NOT open on ANY weekdays, and only open on weekends from 8 AM-12 PM. Huh!" Comments from a visitor on May 12, 2012: "I called on Saturday and they told me their hours were only from 8am to 12pm. I don't know if it was only that day but they may have changed their hours." Comments from a visitor on May 23, 2011: "The clickable map is the wrong location- the farm is actually just off of 441 before SE 119th Ave, between 441 and I75, NOT near Tuscawilla Lake as the map shows. Although the address is typed in correctly, there is some minor change to it that takes you to the right location. Also, went picking on May 21st and there were loads of berries, I barely had to leave my original spot and filled up with 10lbs in a couple hours. The owners are very nice and the berries are delicious. " Comments from a visitor on May 08, 2011: "Had a fantastic time picking berries on Saturday. After getting myself hopelessly lost, I called the farm and the owners gave me fantastic directions and got me there in no time. The bushes are absolutely loaded with amazing sweet berries. The owners are beyond nice and I can't wait to come back next weekend! " 21209 U.S. 301, Island Grove, FL 32654. Phone: (352) 317-6110. Open: Beginning early April, daily, from 9am to 5 pm. If the weather stays on track, we expect to be open to the public in the first week in April. We look forward to seeing everyone out picking in our blueberry fields. Zelma's Blueberries offers a U Pick option for our customers. We love to have people out at the farm and have made our You-Pick season a key part our our blueberry growing operation. Picking season varies depending on weather and when the berries ripen in the fields. We have seven varieties of blueberries on the property, including Windsor and Sweet Crisp. A visitor writes on June 14, 2013: "6/13 Message on answering machine is that they are closed for the 2013 season." Comments from a visitor on May 25, 2012: "The voicemail message of Berry Bay Farm says they will not be open for you pick in 2012." 7650 NE 40th Street, High Springs, FL 32643. Phone: 386-454-3116. Fax: 386-454-3116. Email: [email protected]. Open: Blueberry U-pick opens near the end of April; Monday through Sunday from 8 am to 5 pm. Directions: From Gainesville, Florida, merge onto I-75 North exit 399 take 441 North towards High Springs, Turn left onto Main Street/US 41NW continue to follow US 41, turn right onto SW Poe Springs Road continue to pass Poe Springs on your right keep going until you see the entrance to Blue Springs on your right turn left onto 80 street go to the stop sign and turn right onto NE 40th street, The farm is on your right. Click here for a map and directions. Opening from April 16 to Memorial weekend, please always call head to verify availability, we do not use pesticide on our crops. We do not use pesticides on the crops. Payment: Cash, only. Click here for our Facebook page. Comments from a visitor on April 17, 2012: "This was my first time at Bluebela Farms. I have picked blueberries at other farms and I was really impressed and comfortable here. The bushes are lush, healthy and full of berries. The rows between the bushes are mulched so the walking is easy. Most of the berries were from dime to nickle size. I picked 9 pounds of blueberries. They are beautiful - some are sweet and some are still a little tart. I understand that the berries will really be "yummy" in about 7 to 10 days from now. So I am marking my calendar for a return trip. I am also thrilled to be able to pick blueberries now and not have to wait until May or June. Wonderful! " Comments from a visitor on May 06, 2011: "My wife, son and I came to Blubela Farm last weekend after hearing the blueberries were approaching the height of ripeness. We drove, AGAIN, from Daytona Beach, 2.5 hours away, because last year Blubela Farm grew some of the largest, sweetest, natural (pesticide free) blueberries we'd ever tasted. Upon our arrival we could see that we weren't alone. There were several pickers already in the fields loading their huge plastic buckets full of gorgeous blueberries. It was early in the day, around 9:00, and the dew was still sitting on each berry. We were greeted by the nice owners who told us which part of the fields had the most blueberries to be found. That info was not necessary because there were tons of blueberries in big thick clusters everywhere. Yes, there were many blueberries that won't be ready to pick until next week, but that will just give us a reason to come right back! In an hour we picked 15 lbs of the sweetest most delicious dark blue blueberries, and were all set. At the check-out counter we found fresh BluBela honey for sale. 3 LBS. for $9.00. (Another price bargain no store can match!) Oh, did I say the blueberries were priced the same as last year? An unbelievable $5.00 a LB.! They even have small healthy blueberry plants for sale for those, like me, that want to grow these great berries at home. The farm was ultra clean, the rows of bushes were expertly arranged and manicured, and the shouts of joy from small children to large adults made this adventure one that we will take next week, next year, and for years to come. TELL YOUR FRIENDS AND FAMILIES!!!" Comments from a visitor on May 02, 2011: "Guys they are open again this year and the way it looks has a lot more blueberries than last year, they are big and delicious! The owners always there happy and friendly it is a joy to go pick at the Bluebela Farm, my kids love it! After, spring time to cool it off!! We had a great family time!" Comments from a visitor on April 30, 2011: "We picked Blueberries at the Bluebela Farm today and it was a wonderful experience. The berries are very sweet and tasty and the people are incredibly nice! We hang out there chatting with them for a long time! We got two large buckets for 35 bucks and we ate about the same amount for free... We will go back before the end of the season for sure! It's conveniently located across from Blue Springs, so you can go cool off after the picking! " Comments from a visitor on April 30, 2011: "BlueBela just opened for the season today - 4/30/2011. There were plenty of blueberries and plenty of pickers. This farm has some of the biggest and most plentiful blueberries we have seen. The berries are great. The owners are warm and friendly. Well worth a trip to High Springs." Comments from a visitor on May 29, 2010: "Fantastic!! Couldn't find a sour berry or bad bush and the owners are fabulous. Filled a bucket in about 30 minutes. Don't delay or they won't be there. Between Memorial Day weekend and the next two weeks will be the peak. They are awesome. " Comments from a visitor on May 26, 2010: "this farm is worth the drive. the bushes are full of berries. the owners are very helpful and very fun to talk to. " Comments from a visitor on May 23, 2010:"The farm is great, very clean, nice mowed areas between bushes. The blueberries are delicious. The bushes are so full you can fill up your bucked in a few bushes. The owners are wonderful. It is a little ways off the main road, but well worth the trip. Go pick!!" Comments from a visitor on May 22, 2010: "PLEASE go relieve these bushes of their berries. I have been picking avidly for 10 years in the Gainesville area and have not seen anything like this. They are staying open every day this week to get people out to pick these berries!!!! Bring a suit and go to Blue Springs after." Comments from a visitor on May 08, 2010: "It was an amazing experience! I have picked at u-pick farms before with great experience, but this was really great. Angela and Pedro operate the farm. This is the first year that they have had it operational. The berries are just starting to ripen and there was more than enough to pick. The price was $4.00/lb. They use no pesticides, so it is safe to "sample" while you are picking. The berries are almost as big as quarters and so sweet and juicy! I have some baking into a Blueberry Pound Cake right now! I shared that recipe with Angela via email, and have linked up with her on facebook as well. We brought along a daughter's friend and that friend's mom and they had a great time as well. I think in total we picked 10# of berries. My kids swung on the tire swing when they were tired of picking and mom was not, and Pedro even discussed some "tricks of the trade" with my husband to help my lonely blueberry plant in the front yard do better. My daughter's Girl Scout troop will be picking blueberries as a part of learning about the land and we will definitely bring them to Bluebela Farms. The owners also said to bring our own buckets as they try to be as "green" as possible." 22 NE Cr 234, Gainesville, FL 32641. Phone: 352-337-2544. Email: [email protected]. Open: Blueberry U-pick opens 5/30/15; $3.00/lb; through June and July: Saturday and Sunday from 1 pm to 6; or call for an appt. Click here for current open hours, days and dates. Directions: Click here for a map and directions. We do not use pesticides on the crops. Payment: Cash, Check, Visa/MasterCard. 18120 NE State Road 26, Orange Heights, FL 32640. Phone: 352-475-2015. Email: [email protected]. Open: Store is open Monday through Saturday; Operation hours are 9 am to 5:30 pm; You - pick will open in the Spring, end of March - April; You - picked Strawberries. Directions: Click here for a map and directions. Payment: Cash, Check, Debit cards, Visa/MasterCard, Discover. Click here for our Facebook page. Comments from a visitor on April 06, 2011: "Great strawberries. I have been there twice already and plan to go again. Some prepicked produce also. 9-5 M-Sat. " Comments from a visitor on April 02, 2010: "Went to Browns Farm yesterday, Alachua County, Fl Very nice strawberries, also have u-pick sweet onions and broccoli. Prepicked produce for sale also." 1621 SE 15th Street, Gainesville, FL. Phone: 352-222-0246. Open: Mid June to Mid July; U-Pick when the main gate is open, honk for service; Call for availability. Call before you go - their web listing on the state ag website is gone in 2018. Century Oak Grove and Nursery - pick your own citrus - Call before you go! McIntosh, FL. Phone: (352) 591-1368. Open: November to February; December is mid season for citrus fruit. Almost everything is ripe now (December). Please call with any questions or to make an appointment. Thanks for your interest. . (November 18, 2018). A visitor writes on November 18, 2018: "I called the number this morning and they sounded like they didn't know why I was calling. They said I could come later, so my husband and I came when they said. Nobody answered the door and when I tried to call them, the line was busy. If they didn't want anyone to come pick they should have just said so. That was a long drive for nothing." Saturday and Sunday: 8am till Dusk; our season is usually August 7th till they are gone, which is usually around Labor Day; around the first week in September. Directions: click here for a map and directions. Price Varies. Usually available in August. Click here for our Facebook page. .
Alachua, FL. Phone: (386) 462-3092. Usually available in February to May. Call before you go - this comes from a government website, which may be out of date; and I see there is an oboituary for a Donald King in Gainesville in 2006 (admittedly a ccommon name), but the farm is still on the city's list of actiove farms. If you have recent information , please write me! Orange Heights, FL. Phone: (352) 468-1624. Price: Varies. Usually available in January to April. - Call before you go - this comes from a government website, which may be out of date. If you have recent information , please write me! Comments from a visitor on November 05, 2011: "We went today with our three kids (5, 4, 7 months). There are tons of pecans that are very easy to get. They are $3/lb for upick; $4/lb prepicked. Add an extra $0.5/lb to run through a shelling machine (suggested by the owner and it was surely the best idea). It took us less than an hour to get more than 10 lbs! Some prepicked chestnuts are there for $2.5/lb. The owner is very very nice and helpful. This was a great way to spend a fall day!" 13003 SW Williston Road, Micanopy, FL 32669. Phone: 352-375-0344. Email: [email protected]. Open: Be sure to call before you go; I haven't seen an update about this farm is several years. Fridays, Saturdays and Sundays, from 8 AM until 8 PM. First of August, within a week, until mid-September, more or less. Directions: On State Road 121 (Williston Road), 5.2 miles beyond I-75 going towards Williston. Crops are usually available in August.Payment: Cash, only. Sugar cane grinding an syrup making the first weekend in December. 10804 NW Sr 45, High Springs, FL 32643. Phone: 352 222 1343. Email: [email protected]. Open: By appointment only, call 352 222 1343 for info. Directions: 5 miles S on High Springs on US 27/41. Click here for a map and directions. We are certified organic for all crops! Payment: Cash, Check. Asian Pears, Chestnuts and Baked goods. Hawthorne, FL. Phone: (352) 475-2366. Price (from 2006): Varies. Usually available in September to October. - Call before you go - this comes from a government website, which may be out of date. If you have recent information , please write me! Elkton, FL. Phone: 904-955-9934. Open: May to July. 116 NW 170th Street, Newberry, FL 32669. Phone: 352-472-3928. Open September to October, Saturday and Sunday all day. Directions: 7 miles west of I-75 on Newberry Rd. They have the "hard" persimmon known as Fuyu, and the "soft" persimmon known as Saijo and Hachiya. The season begins in the middle of September. They charge $1.50/lb and supply everything.They also sell many types of fruit trees that grow well in North Florida ,including persimmon trees.A list of some of the trees include citrus, apple, pear, plum, chestnut, fig, blueberry, jujube, olive, blackberry, banana, and others. For plants they are open year round (call for an appointment please). Alachua, FL. Phone: (386) 454-7587. Price (from 2006): Varies. Usually available in October to January. Comments from a visitor on November 14, 2010: "We just went to Ken's pecan farm. He didn't have any you pick this year, but we bought 18 lbs. of whole pecans and 10 lbs of shelled. They were delicious! Ken has all sorts of others trees on his farm too. Peaches, apple, kumquat, figs, etc. If you are in need of pecans or fruit trees this is the man to go to. Ken is a super nice guy and is a wealth of information. Looking forward to next year!" Comments from a visitor on March 19, 2010: "I just called him. His farm location is actually close to Newberry. He still does u-pick pecans as well as sell a large assortment of fruit and nut plants. Nice guy!!! " 116 N.W. 170th Street, Newberry, Florida. Phone: (352) 472-3928. Open: September through October. 15585 NW 29 Street, Gainesville, FL 32609. Phone: 352-214-1028. Alternate Phone: 352-214-0974. Email: [email protected]. Open: Saturday 9 am to 6 pm and Sunday 1 pm to 6 pm; Call to make an appointment for other times during the week. Click here for current open hours, days and dates. Directions: From Gainesville, take State Road 121 north from the Highway Patrol Station, which is on north 13th Street, for six miles to the flashing yellow light. Turn right at the light onto 156 Avenue, go one mile to 29 Street and turn right. Take a left at the first gate on your left and you are there!. Click here for a map and directions. We are open from the middle of August until the end of September. Payment: Cash, only. Comments from a visitor on June 26, 2011: "I've picked here for the last two Fridays and the bushes are still bursting with ripe and ripening berries. This is the best (and tallest) blueberry patch I've ever experienced and the prices are the best too!" Comments from a visitor on May 28, 2016: "Just picked here this morning. The blueberries were fantastic! They were so sweet. There are tons ripe and a ton more that will ripen in the next couple weeks. This place seems to be an old patch that is being cleaned up so don't expect beautifully manicured rows, but you can't beat the taste or price. We got two gallon buckets (about 13 pounds) for $18!". 5716 NW 93rd Avenue, Gainesville, FL 32653. Phone: 352-338-0333. Open: In season, 7:30 AM to 6:30 PM; 7 days a week until the berries are gone. Directions: Call for directions. Payment: Cash, only. Comments from a visitor on May 25, 2012: "The voicemail of Meg's U-pick Blueberries says they are closed for 2012 due to the weather. " Comments from a visitor on June 29, 2015: "We loved it. We took three elementary age kids and they picked a total of 10 lbs of berries with two adult helping. They would have stayed longer but we wanted to make sure we had places to store such a large amount! The farm was safe, very easy to find and the owner was so nice and helpful that even our city dwellers who had never picked their own food really enjoyed it. We hurried home to make pies. We will go back....hopefully next week. " Comments from a visitor on June 04, 2016: "Visited Megs U Pick yesterday (6/23/10) with a group ranging from 6 to 71 years old...wonderful spot, well tended, partly shaded (at least in the am), lots of berries & plenty more ripening. Owner is very helpful and welcoming." Comments from a visitor on June 14, 2017: "We took our kids to Meg's U Pick Blueberries yesterday, June 13th. We picked 7 lbs. and had a great time! The bushes were full of ripe blueberries and had even more that haven't fully ripened yet. Owners are very nice and provided buckets for picking and bags to carry them home. Berries are $1.75/lb. We'll be back next weekend!" 2911 County Road 219a, Melrose, FL 32666. Phone: 352-475-1072. Alternate Phone: 352-224-8322. Fax: 352 475 1072. Email: [email protected]. Open: Friday to Sunday, from 7:45am to 2 pm. Directions: Click here for a map and directions. Blueberries: June 1 to July 14; Seasonal vegetables September to June. We are certified organic for all crops! Payment: Cash, Check. Blueberries are QCS certified. Vegetable are organically grown and are in the process of being certified. Comments from a visitor on June 05, 2012: "Went last weekend and picked 12 lbs in under 2 hours (2 people) for $3.50 per lb. Taste great and were easy to pick. It had rained (tropical storm Beryl) so ground was soggy, but that was the only drawback. Nice people!" Comments from a visitor on May 24, 2012: "There is an ad in today's May 24, 2012 Gainesville Sun saying "Open 7:45am - 2pm. Fri/Sat/Sun"
1425 NW 156th Avenue, Gainesville, FL 32609. Phone: 352-485-1930. Directions: Off Route 231. Open: in June, 7 days from 8 am to 8 pm Be sure to call ahead. Pre-picked available for a higher price. Comments from a visitor on May 24, 2012: "There is an ad in today's Gainesville Sun saying "MONTEOCHA GARDENS-We are sorry to announce that for the first time in over 35 yrs we will not be open for picking Blueberries due to the disastrous weather. We hope to see our valued customers next year & appreciate your business." "
Comments from a visitor on July 04, 2011: "We went to pick blueberries yesterday at Monteocha Gardens. The people were wonderful, with cold drinks, a gazebo with ceiling fan, and chairs to sit and rest. The berries were not as large as usual we were told, (due to the drought) but oh my goodness...the sweetest berries I have ever had the pleasure of popping into my mouth! The price was wonderful also. We appreciate you greatly, and send links of your site to friends often. Thank you and have a wonderful 4th of July." Comments from a visitor on July 01, 2011: "My partner and I stopped by at 7pm on 7/1/11. We were greeted by a sweet dog as soon as we hit the triangle at the gazebo. We had to knock on the door as the older woman who owns the place was working in the garden. She was great! Very nice lady! There are loads of blueberries. I was worried because the best time to pick is usually in June but she has plenty. We had a great time and had the place to ourselves. I would encourage people to visit this farm this month as there are still lots of berries to be picked and they are sweet. The owner encourages you to taste as you go which is helpful when you select bushes to pick from. The 2 of us picked over 7lbs in an hour. " Comments from a visitor on June 27, 2011: "We have gone the last two weekends to Monteocha gardens. Very nice older lady runs it and she has lots of blueberries and wants people to know they are open...they have not had many pickers this year and expect to have blueberries through July. $3/lb U-pick or if you call in advance they will pick them for a slightly higher price (think it is $4/lb but cannot remember for certain). You do not have to call ahead unless you want prepicked. Just knock on the door if there is no response to the triangle/bell at the gazebo. She welcomes pickers any day and time between 8am and 8pm "
Comments from a visitor on May 27, 2009: "May 27, 2009 Update: I just spoke with the owner of the farm. They DO have berries and will be opening on Friday, May 29th. There is always someone on the property so they welcome pickers anytime. Their berries are $3/pound." Lake Santa Fe, Earleton, FL. Phone: 352-468-1790. Open: Call before you go - Facebook reports they are closed permanently (but Facebook is frequently wrong..) 8 am to 8 pm seven days a week; May to June (blackberry), May to July (blueberry, okra, onions, squash, tomatoes). Prices were last reported as: $2/pound blueberries and U-cut flowers: giant sunflowers for $2, medium for $1 and bouquets of zinnia, cosmos and multibranched sunflowers between $1 and $4. Located in Earleton, 2 miles north of SR 26 on the right, on Lake Santa Fe. Comments from a visitor on May 08, 2012: "Called today (5/8/12) and was told that the farm is out of business." Comments from a visitor on June 10, 2011: "It was so nice, a friendly man greets you when you come and he says "One in the tummy one in the bucket." He was really nice to talk to and let my mother and I each have a free sunflower (mine was 1 foot in diameter). A great and FUN experience." Comments from a visitor on May 15, 2011: "Went today to pick some blueberries and was met by and very kind man. He was very helpful and knowledgeable, prices were fair, and he weighed your berries directly in front of you, no funny business. This farm, unfortunately, no longer produces blackberries." A visitor tells me: "Right now (June 19,2008) they have U-Pick Sunflowers,. $2/.5 lbs U-Pick Blueberries - $2/lb"
15912 S County Road 325, Hawthorne, FL 32640. Phone: 352-466-0105. Email: [email protected]. Open: Please refer to website for dates and hours of operations. Click here for current open hours, days and dates. Picking updates: Click here for picking updates. Directions: 25 Min from Gainesville From Gainesville take I-75 S to Micanopy exit. Make left off of exit drive until reach 441 make a right, continue 1.5 - 2 miles to CR 346 Make left, go 5 miles until dead ends onto County Road 325 and make a right farm is 1.7 miles on right From Hawthorne - take 301 to County Road 325 Make left, go about 7 miles and South Moon Farms is on left. Click here for a map and directions. Season is May to July. Check website or call before coming. We use natural practices, but are not yet certified. Organic. Payment: Cash, only. Click here for our Facebook page. CR 1469, Earleton, FL. Phone: 352-468-2087. Open: 8 am to 6 pm every day. Directions: Located on CR 1469 in Earleton, the first farm on the left going north from SR 26, located in front of the former Longnecker's berry farm. Last reported price was several years ago at blueberries $2.75/pound if you pick, more if they they pick. Typically available May to July. A visitor writes on June 01, 2013: "Southland is open 8 am to 6pm as of 6/1/2013. They said they have a fair amounr of berries but are getting heavy picking, probably because most other places are not yet open. $2.75/lb." Comments from a visitor on June 02, 2011: "Just picked 5 lbs of blueberries at Ms. Joanne's and had 10 lbs picked for me. Wonderful!! The bushes are heavy with berries. They have pruned some of the bushes so you have your choice of lower thicker bushes or you can pick from the tall bushes that have more berries(some of the branches are bending to the ground) and less leaves. The taller bushes also provide great shade so you are protected from the sun. The berries are plentiful and sweet. The best thing about Southland is that you get Ms. Joanne. Sitting around talking to her is like talking to a best friend. Thank you Ms. Joanne and all of your wonderful helpers. Great fun!!" Comments from a visitor on June 01, 2011: "Visited this farm on May 31st,2011 and picked almost 20lbs of great Blueberries. Bushes were plentiful and lots of berries to come still. $2.50 a lb." Comments from a visitor on June 03, 2010: "Just picked 8 pounds of blueberries at Southland going down just one row! This is a great place! Lots of shaded area to park your car. Picnic tables for lunch or a water break. Rows are clean and well maintained. And most of all ripe, sweet BLUEBERRIES!!! Enjoy!!" Comments from a visitor on June 04, 2009: "Farm is open for u-pick blueberries. 8am to 6pm. Price is $2.50/lb"
Comments from a visitor on June 15, 2008: "I was just at Miss Joanne's with my two year old and a friend (in the rain even). We had a marvelous time. The "plantation" is quiet and loaded with berries even as of today. We picked nine pounds in about two hours even while monitoring the little one. Miss Joanne is a lovely woman. She wants to stay open until the 4th of July because of the good crop she's had this year, but fears most people think the jig is up on the berries this year. An added bonus - her berries were only $2 a pound. 17228 NE County Rd 1471, Waldo, FL 32694. Phone: 352-468-3387. Open: Call before you go - I haven't had an update from this farm in years and there is nothing current about them on the internet; last reported was May - July, 10am - Dark. 2004 prices: $1/pound. 5-acre farm. Directions: located on CR 1471 between Earleton and Waldo. 11325 NE US Highway 301, Waldo, FL 32694. Phone: (352) 468-1903.Open: see their page. Straughn Farms is a family owned commercial farming operation that grows 750 acres of Blueberries and manages 3,000 honeybee hives and 200 head of cattle. You-Pick muscadines start in August at $1.00/lb (2017 price). Bronze and purple varieties available. Archer, FL. Phone: 352-495-7340. Open: Call before you go - I haven't had an update from this farm in years and there is nothing current about them on the internet; last reported was May to June. 1223 SW 136th Pl, Micanopy, FL 32667. Phone: (352) 538-3290. Email: [email protected]. Open: Blueberry season is usually March and April; Thursday through Sunday 9 am to 6 pm. Wacahoota Farms is a You-Pick Blueberry Farm, In Micanopy, Florida. We are proud to be able to offer the highest quality of Blueberries to our customers. They have 8 different varieties. 2018 PRICES: $18/gallon bucket or $4/pound. Payment: Cash only. 5870 NE 77th Ave, Bronson, FL. Phone: 352-486-2509. Open: Call before you go - I haven't had an update from this farm in years and there is nothing current about them on the internet; last reported was May and June. Comments from a visitor on June 04, 2011: "Great experience, nice owners"
3534 NE CR 234 Gainesville, FL 32641. Phone: (352) 468-1903. Open: Typically April and May, weekends, from 8 am to 6 pm. 2018 price: You Pick Blueberries $3/lb. 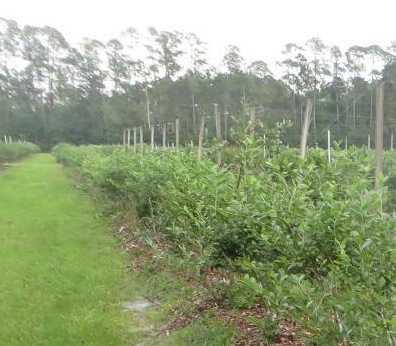 Pre-picked Blueberries $4/lb., must pre order for pre-picked. .
1127 Blackburn Rd, Pierson, FL. Phone: (386) 749-4325. Open: Usually available in October to January (citrus), September to end of season (persimmons); Tuesday to Sunday from 9am - Sunset; preferably with an appointment. Persimmons - harvest in September, October. Citrus: Navels, Hamlins, Red/Pink Grapefruits, Ponkan Tangerines, Satsuma, Lemons, Limes. Fish: Hybrid Tilapia - Blue and White (Mojarra). Our land is pesticides, fungicides free. The citrus season starts a week before Thanksgiving and lasts till March (May for grapefruits). Please feel free to call us for availability and directions. A visitor writes on April 17, 2015: "We contacted the farmer by cell phone, used (386) 749 4325 and he responded in a friendly way, giving us details. On 4/3/2015 we picked bags of grapefruits, some limes and lemons - all delicious - all still available, lots left. Price good. Huge grapefruit trees, picked with a grabber on a pole, also fabulous smelling blossoms."